Its Just A Guy Thing! Who Is Mr. Modern Guy? Musician Prince had one of the hottest Oscar After parties for the 2008 Academy Awards. This year was all about the glitz and glam. This is a show which almost did not happen because of the writers strike in Hollywood which sent many prime time shows and movies into hiatus. The Oscars this year was an elegant event with the writes strike over its time for all of Hollywood to come out an play. Notabley missing from the party scene is the Vanity Fair party which is always a hot spot after the Awards Show. This year Prince’s Party is the new Vanity Fair party. The Oscars according to ratings were a dud but I have to give credit to John Stewart because he had a lot of funny momentsduring the ceremony. Sean “Diddy” combs who is promoting his role in the ABC movie, “A Raisin in the Sun”, also made an appearance with his costar the lovely Sanaa Lathan. 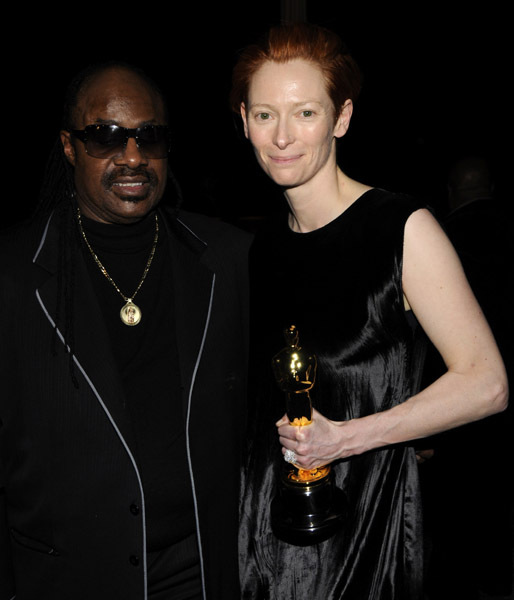 Javier Bardem and Tilda Swinton who were among the four foreigners who picked up acting award honors were also at Prince’s Party. Speaking of Tilda Swinton she must be on cloud nine for winning the Best Supporting Actress Award and Javier Bardem for Best Supporting Actor for his role in the movie, “No country for old men”. How to Get Six Pack Fast on What The Average American Guy Would Not Wear! gabe on Louis Carreon Debuts His “New Filth” Collection.